I just got this crib mattress protector pad from Solutions Solved. As a mom of four daughters I am always doing the laundry and house chores while still trying to find time to play with the kids and of course blog too! So I love this mattress protector pad from Solutions Solved. It really saves the mattress whenever there are messes in the crib. As much as I hate it, it seems like there are times when the baby has an overflowed diaper or it leaks so it’s really good to know that if that happens the mattress is going to be safe from damage. It’s waterproof so it doesn’t soak into the mattress pad. So I can just take the sheets off and wash those. It’s a bamboo material so it adds some extra softness to the mattress too. It’s made from high quality bamboo viscose fiber as well which is a great product that is waterproof, soft, and high absorbency. It is also a repellant of dust mites, which could really be a life saver. It will keep the mattress dry, clean, and healthy. I just love ours! 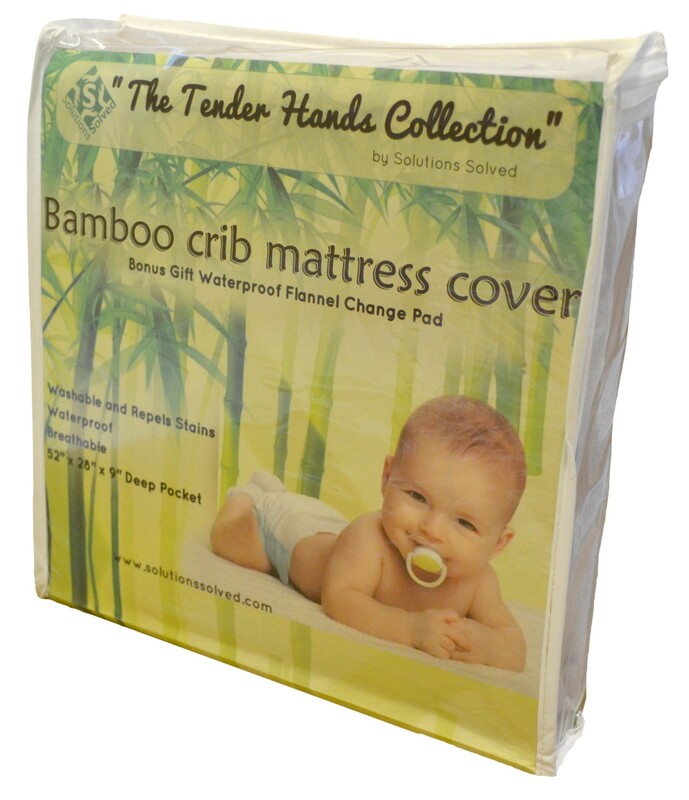 EXTREMELY SOFT: The top layer of the protector is Bamboo terry weave which is ultra-soft to the touch and creates a cozy and comfortable surface for your baby. WATERPROOF AND DURABLE: Breathable and waterproof which prevents pesky leaks to protect your baby or toddlers mattress. It is very absorbent and washer friendly. Buy two or more and always have a fresh cover on the mattress at all times. FREE BONUS GIFT: Buy now and receive the great bonus gift of a large waterproof baby change pad which gives protection when changing your baby on furniture, beds etc. DEEP POCKET DESIGN: Crib mattress protector sides are 9 inches deep that wraps around the bottom of the mattress to ensure it stays in place on the mattress. The overall size is 52x28x9 fits on all standard crib and toddler mattresses. 100% SATISFACTION GAURENTEE: It is our guarantee that the quality of our product will meet all customer expectations. If you are not 100% satisfied we will make it right. You can purchase this mattress cover on Amazon!